With a little fear and trepidation, I looked at the mountain ahead of us as we drove from Imerovigli to our planned outing for the day. 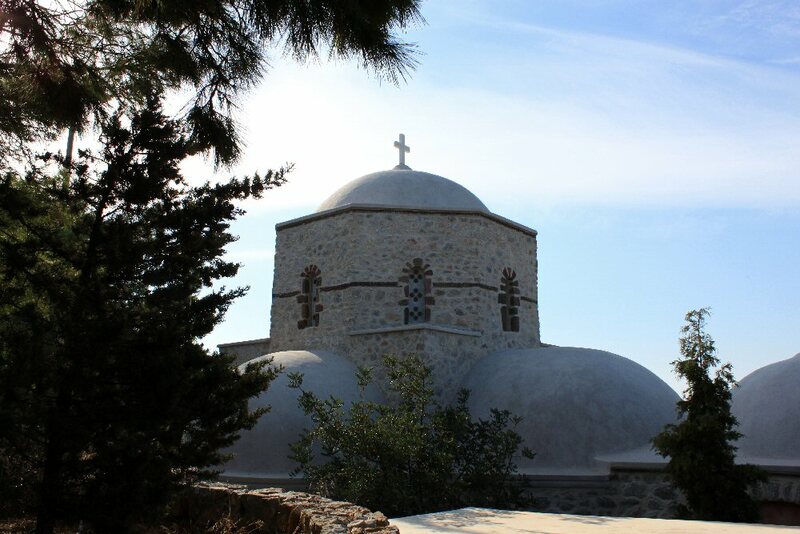 Profitis Ilias (Prophet Elijah) is the highest point on the island boasting a view from almost 1600 feet above sea level. The mountain gets its name from the monastery that was built there in 1712. We've driven up mountains in several countries and more than once to the top of Haleakala on Maui. How bad could this one be? I read somewhere on a travel site that if you were prone to motion sickness and wanted to make this drive, you might want to take something before you start out. Good advice. The switchbacks were some of the best I've seen but thankfully the road leading up was good and we didn't pass any huge tourist buses. We arrived at what looked like a parking area and nuzzled into a spot. The view was spectacular and we weren't even all the way to the top yet. Not knowing if it were possible to drive to the monastery (it was) we walked up the rest of the way. The walk was kind of fun since we were enjoying the warm sun and the cool breeze from the ocean. In the middle of summer though I don't think it would have been as enjoyable. The courtyard to the church at the monastery was open as was the church and we slipped in through a doorway in the wall that surrounded it. The monastery actually looks like a fortress of sorts but I think if you build something that high up in the middle of an island that lies in the middle of the sea, you want to buffer the wind. There were only a handful of people wandering around and the courtyard was so peaceful, you wanted to linger. We enjoyed the views. Now more familiar with the island, we could pick out points of interest where we'd already been. Inside the small church, the gold accented icons and furnishings gleamed in the morning sunshine that peeked in through small windows. At one time the monastery apparently owned its own ship and conducted private business for the monastery. Later it became a school where the Greek language and literature were taught. 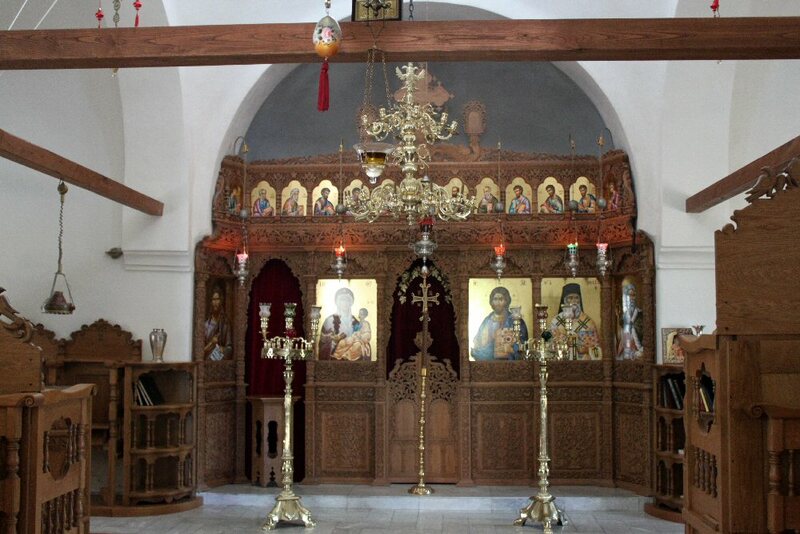 Today it houses a collection of artifacts from the Greek Orthodox religion. On our way back to the car, we were stopped by a couple on a four-wheeled ATV. They asked if we spoke English. Bob's answer: No. American. They got it. The Aussies always do. We had a great conversation with them about what we'd seen and tried to help them navigate their map. Bob tried to get them to convince me that the ATV was the way to see the island but somehow looking at the wife on the back I wasn't convinced--not at my age anyway. 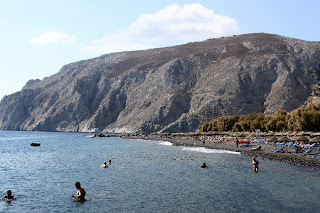 At the base of the mountain, we followed the signs for Kamari, the town where there was a large black beach. Kamari was definitely a beach town. The road that ran the length of the beach had lots of hotels and restaurants on one side and open air cafes and smaller restaurants on the beach side. It was too early to eat lunch but it was too inviting to pass up a chance to sit and enjoy the fresh air. We found a cafe with cushy chairs and ordered two cappuccinos. The black beach is a little rough to lay on since it is mostly pebbled but there are lounge chairs and umbrellas for as far as the eye could see available for a rate of 5 Euros for the day. You pick your spot and go to the hotel or restaurant that hosts the spot and pay for the use of it. 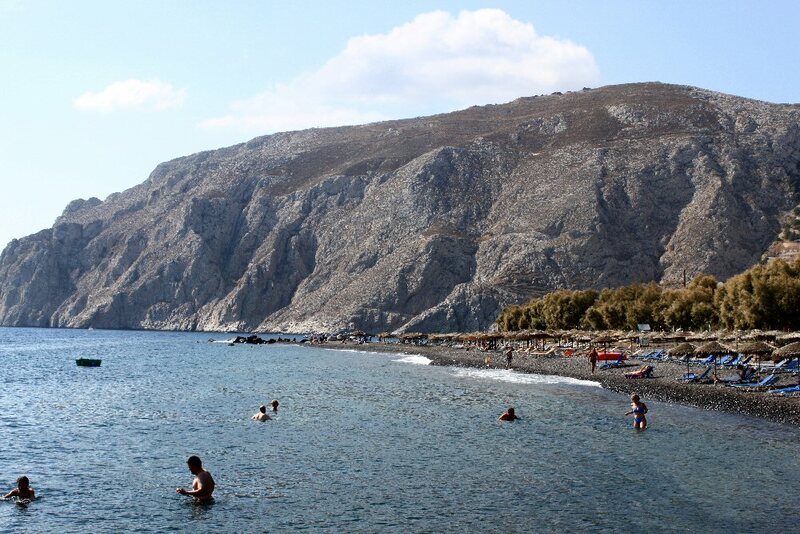 If I were going to spend a day at the beach in Santorini, this would be the place. There were showers along the beach and here and there a booth to change clothes in. And lots of places to enjoy snacks and a meal. 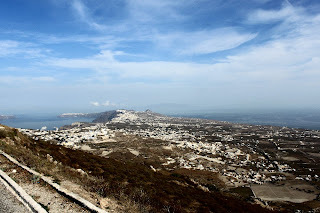 Apparently not having his fill of switchbacks and cliff side roads, Bob decided we needed to see the other port on Santorini. It's a newer one and has access by road making it a little easier to get tourists on excursions into a bus and on their way. If you have an excursion by coach, this is where your tender will bring you. Your ride up will be thrilling. This is also the port where the large ferries come in from the mainland and probably other islands. 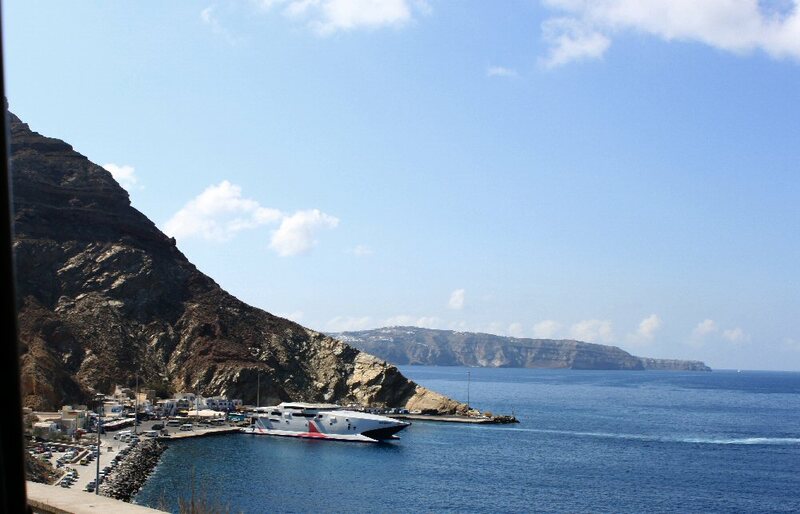 It's a pretty fast ferry but it still takes about five hours from Athens to Santorini. We had considered taking it but understood that sometimes due to weather the runs can be canceled and we didn't want to be delayed. The temperature was climbing and we had already decided that we were going to spend the afternoon just being lazy. We drove back to Imerovigli and our B&B, Casa Bianci and parked. Just around the corner from the little school where we parked, we had seen a supermarket. At home it would be considered a convenient store but we found some great cheese, a fresh loaf of bread, and a sweet delicious apple to munch on for our lunch. It was our concession to our diets. Are you buying that? The afternoon was spent reading and downloading another book from the library at home. (Love my Nook). We took a short walk--after all, exercise and diet go hand in hand. We were being so good. Then we freshened up, put on long pants and grabbed a sweater for our evening in Fira. I know that sounds crazy but once the sun went down, we found the evenings cooled off considerably. In Fira, we parked in the public lot and walked past the cathedral where people were already gathering for the sevenish sunset. We wanted to find the restaurant that had been top-rated on TripAdvisor.com. Unfortunately it was not along the cliff side where you had a view so we doubled back to search out a spot for the sunset. 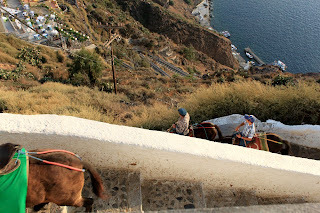 We were near the funicular that transports people up and down the cliff side to the old port. On a previous cruise stop, we had taken it to the top. 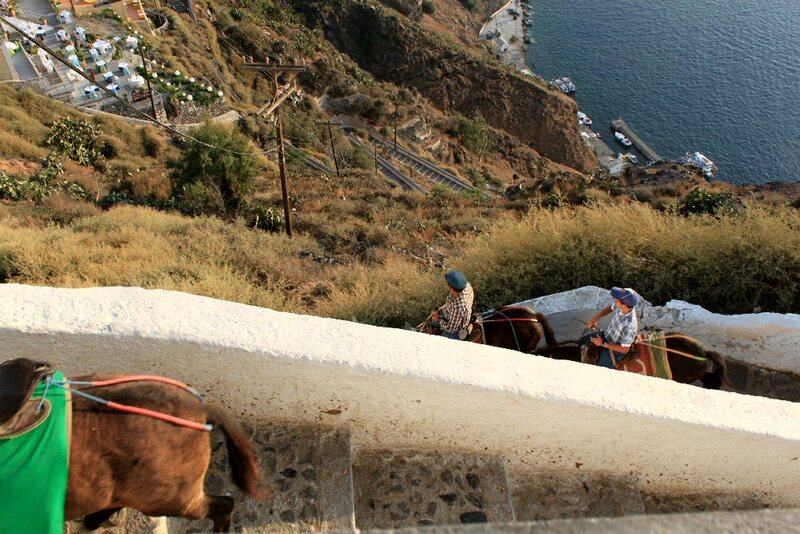 It was the alternative to riding a donkey up a stepped trail with lots of those wonderful switchbacks. 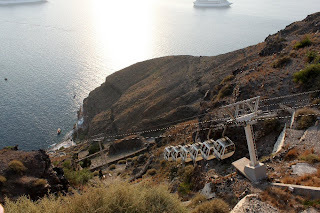 I remember the ride in the funicular well because the woman sitting next to me was so scared that she shook violently all the way to the top. Can't imagine how she would have survived a donkey ride. There was a spot we claimed in one of the cafes where we ordered a couple of tropical drinks and again watched a beautiful explosion of color as the sun dipped below the clouds on the horizon. Then it was off to the restaurant. What we didn't know or expect was that it was also the end of the day for the working donkeys. As we rounded a corner, they were all waiting in a small courtyard to be led home. 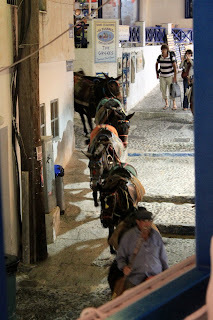 Suddenly, we found ourselves pinned against a wall as the donkeys began following their owner. Closer and closer they came to us. I wanted to stare one in the face and say, "Hey, look. I didn't ride your back today. Don't take it out on me." They eventually passed and we crossed the street to our restaurant unscathed and hopefully not smelling like donkey. The restaurant was on the second floor and looked out over the corner of two narrow streets. We ordered a Greek dip called tzatziki that came with pita bread. It was a cucumber and yogurt mixture. Delicious. I was feeling a bit adventurous. 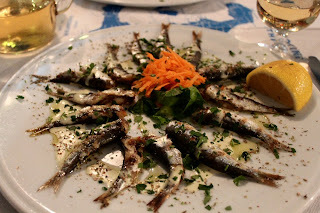 Actually, we had tried to order one thing each meal which was truly Greek and I knew that sardines were a specialty of the area so when I saw them on the menu, I decided to try it out. The sardines were grilled in olive oil and were a bit crunchy mostly because of the little bones in them. There wasn't a whole lot of flavor but they weren't bad--just not as good as most of the other things I'd ordered in the past few days. I smothered them with lemon and ate them all. 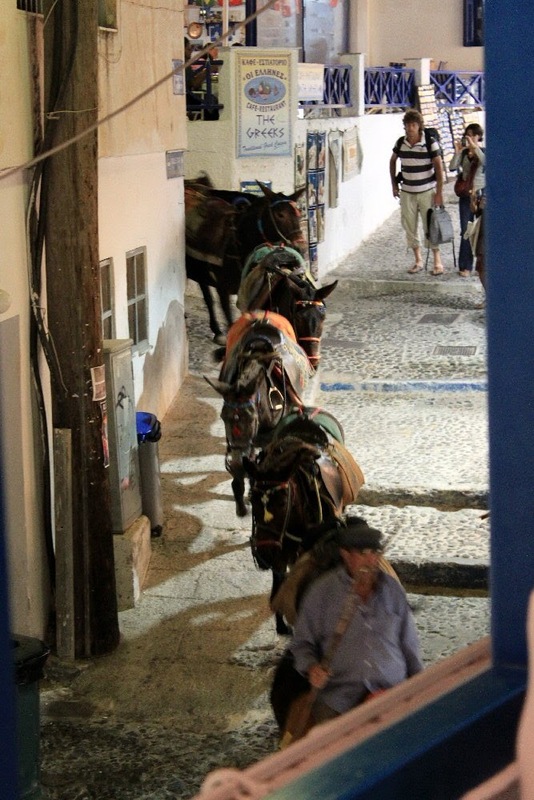 While we were eating, another bunch of donkeys were making their way home. They looked weary. What a life. After dinner we strolled through some of the narrow pedestrian streets where shopkeepers were still open. I wondered if that was because there were still cruise passengers out and about or if Fira just stayed open late because there were so many people milling about. This would be our last evening in Santorini. I wasn't sure I was ready to leave yet.